CJ5. 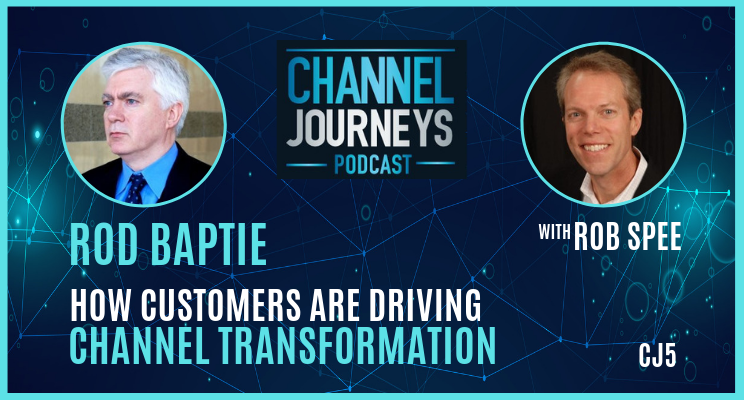 This episode features Rod Baptie, the founder of Channel Focus – the world’s largest community of channel professionals. Rod shares his channel journey that took him from London to Colorado to Scotland. 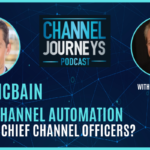 Hear how customers are driving channel transformation – having a huge impact on vendor programs and partner business models. 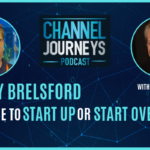 And learn what you can do to drive channel growth as traditional channel partners are exiting and merging and a new whole breed of partners is emerging. The Channel transformation we’re experiencing is both technology-driven and customer-driven. In response, new channels are emerging and existing partner business models are changing to meet customers’ needs. The old technical services no longer needed. Partners are challenged to provide a much more important service – that of genuinely helping their customers build a more successful and profitable business. This in turn is driving a huge trend towards specialization. The money now is in becoming specialized – either vertically or technically. And we’re seeing a rise of the micro-vertical solution provider. For example, a born-in-the-cloud IoT company focused on wine growers in Napa. There’s a new breed of “shadow channel” partners. If you have a financial SaaS solution, you want to take it through the CPAs. If you have a marketing SaaS solution, you want to take it through marketing agencies, and HR product, through HR consultancies. We’re also now seeing born-in-the-cloud CPAs, HR firms, etc. who are technology companies with business expertise. The Channel Focus Club 50 is a gathering of the most powerful channel leaders discussing top issues. Cloud Services Community of around 5500 CEOs of partner companies actively selling cloud (at least 50% of their business is cloud based). Estimates there are upwards of 30,000 organizations selling cloud products and services in North America alone. Huge trend towards specialization. Money for cloud providers is no longer in moving customers to the cloud. Still lots of customers who need to move to the cloud, but it’s becoming a commoditized business. Money now is in becoming specialized – either vertically or technically. New breed of “shadow channel” partners. If you have a financial SaaS solution, you want to take it through the CPAs. If you have a marketing SaaS solution, you want to take it through marketing agencies, and HR product, through HR consultancies. Now seeing born-in-the-cloud CPAs, HR firms, etc. who are technology companies with business expertise. And seeing the rise of the micro-vertical solution provider. E.g. born-in-the-cloud IoT company focused on wine growers in Napa. Rod’s favorite sport is rugby. Holds season tickets to Glasgow Warriors and Scotland team. Raised in London. Now splits time living in Colorado and in Scotland, just north of Edenborough. Rod’s a dog lover. Has 3 Springer Spaniels and walks them 5 or 6 miles per day. Half way through getting his helicopter pilots license, has 4 motorcycles, and has never learned to drive a car! Started his career as a chef then became an entrepreneur. First started advertising agency. Then set up a consultancy business. Launched Europe Direct events – all about direct marketing and direct sales. Started working with IT distributor and migrated to setting up Channel Focus events 24 years ago in Europe, then US 2 years later. Big trend in partner-to-partner partnering. With cloud, customers need more than most providers can offer and they want it tomorrow. Only way to serve the customer is for partners to partner with other people. Channel Focus May 2019 in Carlsbad, CA. Will be talking about specialization in channel, initiatives vendors are taking, success stories in channel transformation, building global partner programs. Holds workshops where you can bring questions, get really cool answers, and go back to the office and be a super hero with answers to questions that have been top of mind. Channel transformation that we’re experiencing is both technology-driven and customer-driven. New blood coming into the channel. Old blood exiting the channel. New channel emerging and changing, and partner business models are changing dramatically to meet customers’ needs. Old technical services no longer needed. Real challenge is for partners to provide a much more important service – of genuinely helping their customers build a more successful and profitable business. Advice to new channel managers – really understand your partner’s business model and the challenges they are facing as a company. Do that an you can walk into the partner’s CEO office and have a meaningful conversation. Industry has to do a better job of training and enabling channel managers to discuss business issues with their partners. As we look forward, we’ll see more specialization, different routes to market providing different types of services that are more business related. People who build the skills and expertise to talk to specific business challenges will be the most profitable.